Well yes, considering he leaves on a free if you don't accept may as well get the 6million. Matthew targett or Tymon in as a replacement would be ideal. Cheers, sold Taylor and bought Targett as his replacement. Targett doesn't look as good as Taylor, but with first team football he should develop nicely. 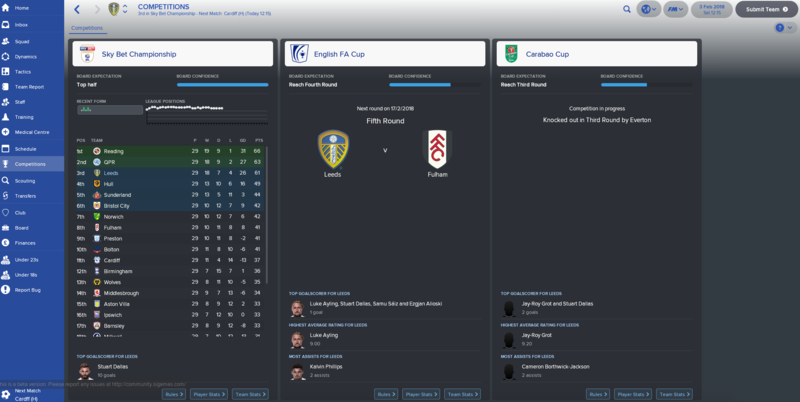 I'm starting a save with Leeds (always do one each year). Now I'm trying to implement a 3-6-1, with the last patch. I think that the team have a great team to be used with this system, but I need some CD... any suggestion? Also I will need an AM C or to adapt someone. Should I sell Taylor? Put him in the transfer list? Also started a new save on the new patch, finished first season as champions, now looking to build the team for Premier. Signed Jansson and Bartley for now but there are lots of areas to improve and Massimo only gave around 9m for transfers. In the first season? No one! No loan signing and not a single player signed. No one i wanted was available for what i was willing to pay. Sold Doukara for 1.4m in january and Taylor in Mls in april for 2.3m . 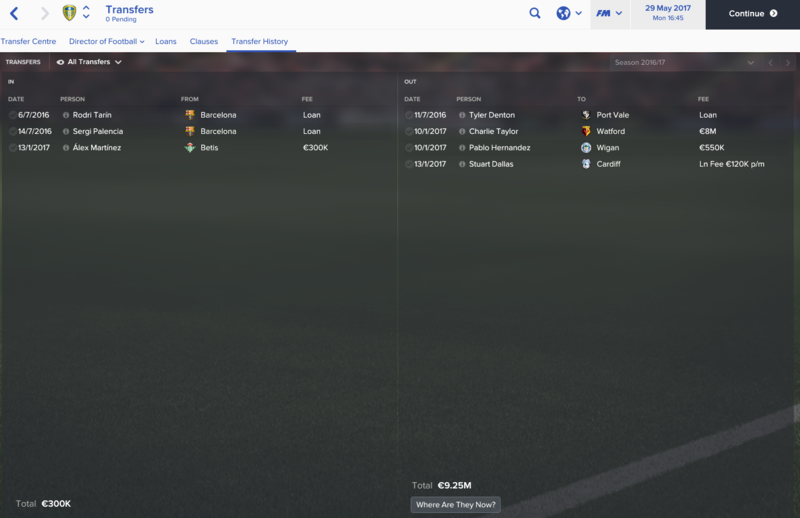 After getting promoted in the first season I'm looking to make a team capable of surviving in Premier League. After Jansson and Bartley, I brought Antonio Luna and Benoit Costil on a free and loaned Tammy Abraham. Paralyzed by choice! 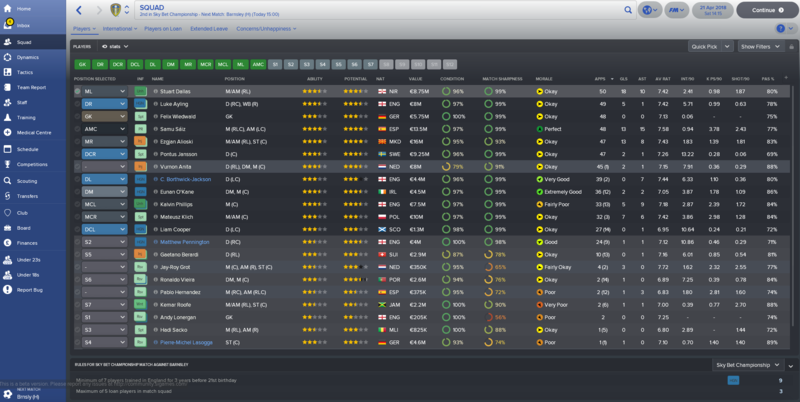 Obviously I can't sign all this players , but who should I bring in? Who would you sign? Any advice? Winter has come, and I'm in 1st place (at 31 of January) with Newcastle. The 3rd team is just one point below us. 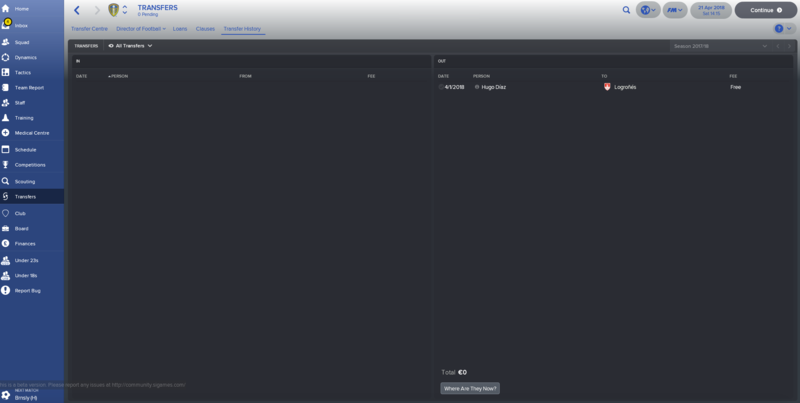 I have sold Taylor, at the start of the season, for 8M. I bought Jason Cummings and Leonardo da Silva Lopes, but the last one will just join the team in the end of January. 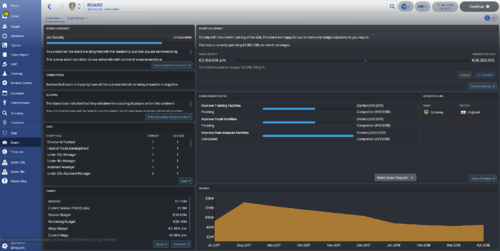 I was able to grant the loan of Borja (already extended for one more season) and Franz Brorsson. Alfonso Pedraza, had also the loan extended for one more season. Marcus Antonsson and Berardi leaved the team in January; they were making a lot of noise. The key players are Ronaldo Vieira (the DLP) and Kalvin P.
I have some questions for next season, and the first is who to sign in free, because there aren’t great players… and should I sign another contract with Green? I prefer Silvestri as the number 1. Would like to add Kyle Bartley to the team, but he don’t want to negotiate a contract with me, and he have one problem… to many injuries. My current Leeds team at the beggining of season 3! Nice squad you got there mate. Don't like Cahill, but otherwise, top notch. How are you doing so far? I started a save with Leeds not so long ago and found a lot of inspiration for players and tactics in this thread. Therefore now when I'm halfway in my second season I thought that I would share my experiences with you guys. 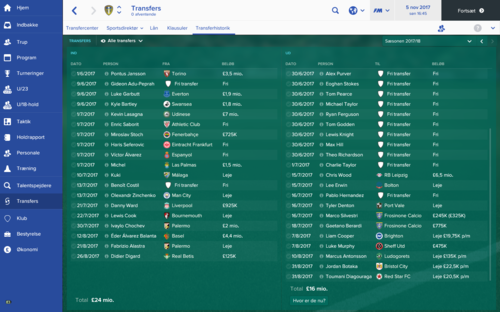 My save is started with update of the January 2017 transfers. In my first season I finished 6th and won the playoff final and claimed the promotion, so lucky, won the semi on penalties and 2-1 in the final. So now I got the team in the Premier. First I'm just going to write a few thoughts on the first season and afterwards about the second season. 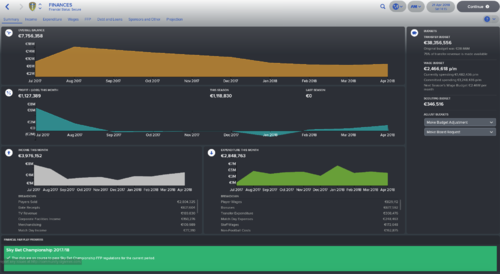 A piece of advice, also mentioned by others earlier in this thread, sell Charlie Taylor in the first window, he's going to leave anyway, so just try to get as much money for him as possible. It's going to give you more money to move around in the first transfer window, where we start of with a small budget, think I started with around £500 k. So cash in for Taylor would be my advice. I didn't do this, and of cause Taylor is a quality player, so he played very well, but if I could do something over for the first season it would be to sell Taylor. You might look for Tyrone Mings or Matthew Targett as replacement. So I didn't sell Taylor, which left me few opportunities in the first window, so i got two players in on free transfer (Kieran Richardson and Ronaldinho) and two on loan (two defenders from Spain). All of them just got a role as back-up players. I tried a couple of different formation the first season, but had most succes with classic a 4-2-3-1 formation, the one you can find in the very first post. However, I also had some succes with a 4-1-3-0-2 (One DM and no AM), a formation where I had Chris Wood on top together with either Doukara or Roofe. As mentioned I got the promotion, so I had to prep the team for the premier. Also I like to play a formation with ball-playing central defenders, a defensive midfielder, attacking backs and inside forwards on the wings. 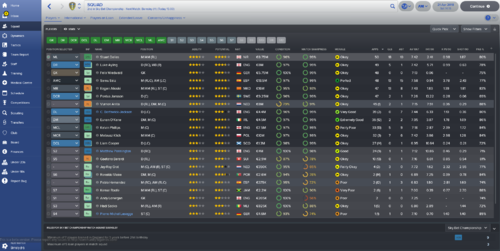 A formation I didn't had the players for, so I had to do a lot in the transfer window, so I almost sold half of the team. I also sold Stuart Dallas for £ 50 (65). As a sold half the team I also got in a lot of new players, I'm just going to highlight some of them. Benoit Costil (GK): Green stopped after the first season and Silvestri made a lot of noise, so I didn't want him in the club. I got in Costil on free transfer, and he has been a key player for me. Really good performances. Michel (Right back): Got him cheap from Las Palmas and he has already been worth all the money. Really good value for money in him. Miroslav Stoch (left wing): Also good value for money in Stoch. He fits my tactic as the inside forward on the left wing and with Roofe as a back up. He's best if you have a tactic with inside forwards. Lewis Cook (loan): Why was he ever sold? Hope I can get him on a permanent deal, but it's going to be hard. Seferovic: A good attacker, I got him on free after first season. I think he's same level as Lasagna, just costs a lot less. Definitely worth going for Seferovic. Chochev: Last player I want to highlight. He has also been a really good player for me. A good box-to-box midfielder, so check him out. I have also tried to get Snodgrass back to Leeds, but he wanted too much in wages. I'm still looking for a right winger, I have two players on loan covering that position now, Zinchenko from Man City and Kuki from Malaga. Zinchenko has been good, Kuki not so much. So I'm still looking for a good right winger, I think I might go for Solly March from Brighton. Currently playing FM17 on the iPad and have just beaten Man United at Old Trafford in my first season back in the prem. Last minute Kalas goal. Best feeling ever! Must agree with some other sentiments on here, Jansson is a monster even in the Prem. Player who has surprised me though is Roofe. Played okay in the Championship but has been dominant in the Prem when fit. Lucas Evangelista makes a great loan signing first in the Champ then again in the Prem. 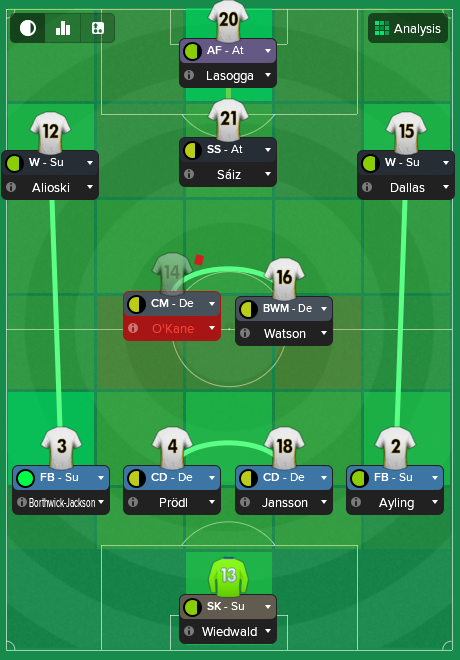 I've started my last save of FM2017 and thought i'd try one of the 5-at-the-back-strikerless tactics for a bit of fun, means the squad needs an overhaul from the start. 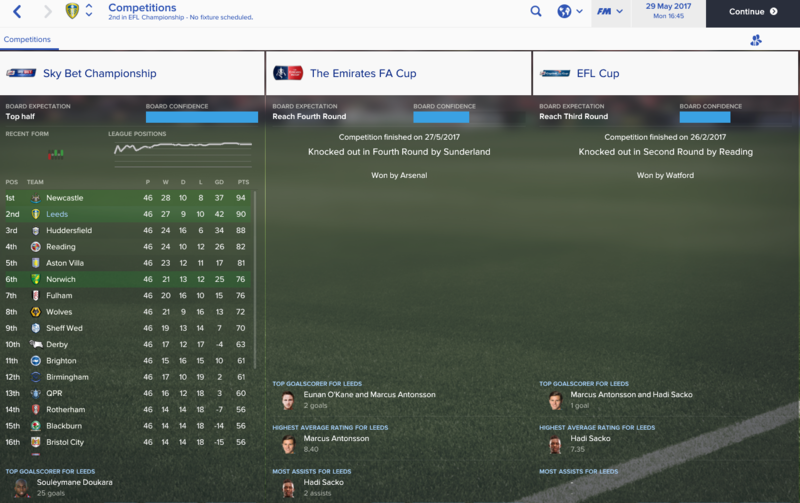 Currently 15 games in and sitting at the top of the league, will post a quick update at the end of the season if anyone is interested. Sure mate, post it. I might also start with Leeds tonight, plan on trying infamous chinese strikerless so i would like to see how you lined team up. Going with a high press and pressure philosophy, with lots of hard working players. Got promoted to Prem, behind Newcastle. Was on top for quite a while but bad form hit us nearing final few games. Still, delighted with work done so far. Taylor went to Watford in january, 5 mill upfront, rest over 12 months. Hernandez annoyed me with his non-stop complaining so he had to go. Love Dallas so much, from last year FM, when he was a fantastic for me. But sadly, i don't play with wingers and he went on loan to Cardiff. Gonna try to offload him when transfer window open in summer. Tarin and Palencia got in for rotation and Martinez was decent replacement for CT. In preparation for return to PL, we signed Bartley for 2m, Michael Santos, striker from Malaga, as i wasn't pleased with Antonsson and Roofe. Last, but not least important, we've brought Jordan Ayew from Swansey, 2.4 mill. Pontuss Jansson is coming too, of course. And still got 5m in transfer kitty. Our job is not yet done. Still looking for backup GK for Silvestri, perhaps better wingbacks, quality CD, good box2box midfielder and maybe another striker, if i can sell Anton/Roofe to someone. Surely not gonna hit all those targets since we have such little money available but i'm gonna get what i can. Player of the season?? Can't believe i'm saying this... Bloody Souleymane Doukara. Played great as a supporting striker and when he hit a dry run in the last few games, we started to struggle. Don't like him IRL, always sold him in previous Leeds saves. But after great season like this, i've decided to keep him. To see what he can do in Premier League. Is it FM18 time yet??? Genuinely can't wait, all being well it should be a vintage year for LUFC. has anyone edited the squad (or downloaded an transfer update) to test the new players signed this season? If so, how good are the new players on FM17? Done a bit of research into the new signings using this years database. Buoy, Ekuban, Klich and Cibicki no idea - that said on Cibicki, he doesn't look like a player who top level european clubs were looking at. Alioski has workrate, strength and balance issues. I won't reveal PA's but safe to say on initial impression a few look a tad on the low side - we'll see what happens. Again. just my opinion and it's early days, but based on the above the squad quality won't have been improved on FM as much as it has IRL (based on todays numbers). 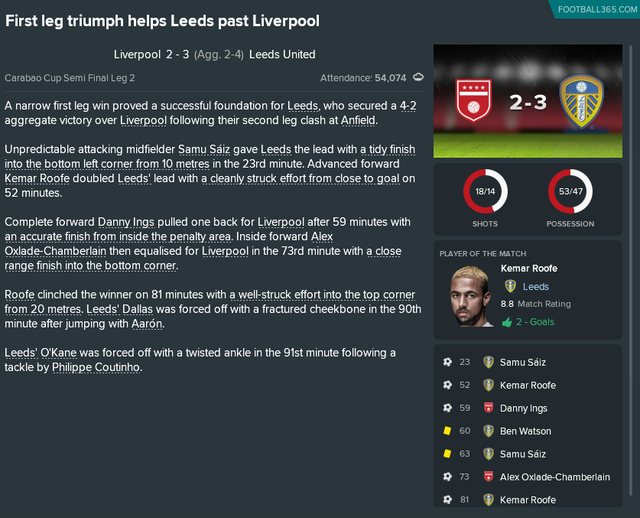 I started a new save with Leeds, Aloski, Klich, Roofe and Wiedweld have been good for me, I signed S.Bassong on a free and he has been a rock for me. Pontius Jansen wanted to leave for a bigger club so sold him for 13m to Newcastle, I have Matthew Pennington and Liam Cooper rotate to play alongside Bassong but will look at getting a good centre back in the summer. 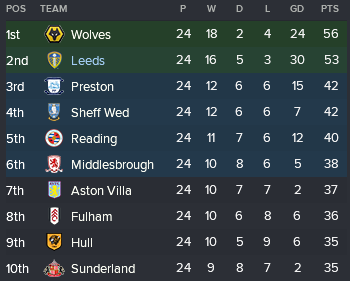 Nearly finished the season, currently 6th with 4 games to go, really enjoying the save. Has anyone set up a Leeds thread for Fm18 yet? From k23 ,there are Temenuzhkov ,Downing and 2-3 more that maybe have a future. - Felix isnt scared of crosses!! Bravery 13? Samu Saiz- work rate 8 seems low and bravery 9 too. If you compare Saiz to Alioski (bravery 14) that doesnt seem right to me. Also what is Saiz's consistency rating? - Borthwick-Jackson stats seem quite high consider the lack of impact he has had at Leeds. - Alioski is very inconsistent. Pretty similar to real life, but not sure what stat you gave him? 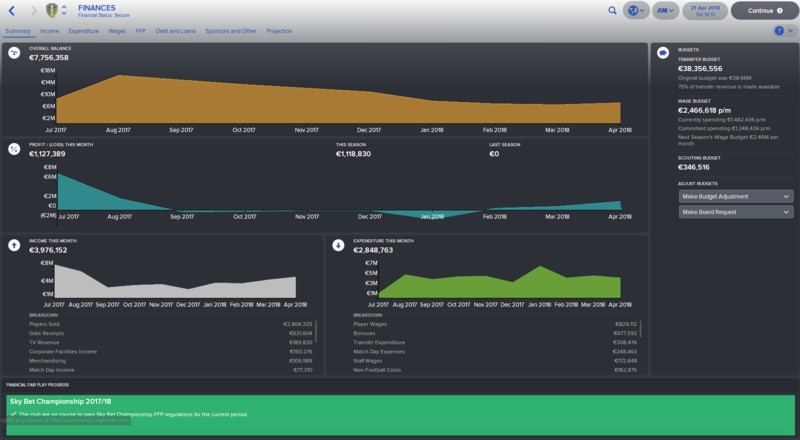 Pontus Janssson- contract now runs to 2022- dont think the game database reflects this. season ticket sales are down by 2k - 18k versus 20k. Club have just appointed another coach- one to add before 10th Nov.
Vieira is Portuguese on the game, but he plays for England. Unless I am mistaken this isnt reflected in the game? Why is Vieira a loner in the social groups? After being an important players last year surely he would be comfortable with the rest of the team? Wiedwald - Mostly his attributes have only been slightly tweaked from the previous research, if needed I will make larger changes come January. However, 13 is not low. Saiz - Again as above it is more a case of tweaking the previous researcher's work rather than overhauling it (unless grievously wrong) at first. I would certainly say Alioski deserves higher ratings than Saiz here, but the reason the gap is so large is Saiz's CA. I upped his CA and a few attributes to get him towards the levels at which he has been performing in reality, but unfortunately we've pretty much run out of CA for any further improvements. Certainly one to revisit in January, but for now something would have to be downgraded for something else to be upgraded. CBJ - I've barely touched him from the previous researcher, we've not seen enough of him for me to be able to make a fair judgement, especially considering he is only on loan (so I won't get to fix any long term changes). Pontus - This was signed after the Beta DB was locked. It has already been updated my end but you will have to wait for the next DB to see it in game. Coach (Vio) - That was literally yesterday, don't work that quickly! It's been done but again is awaiting an updated DB your end. Vieira - He has several dual nationalities, you can find these under his 'Information' page. He is yet to declare for anyone nation (in game we consider this to be either a literal statement or making a competitive appearance for the senior team). Thanks Seb, that all makes sense. On Felix i was suggesting he should be downgraded on bravery from what ive seen! Quick one @Seb Wassell does this count as a declaration? Been playing around with the Beta for a while, found a couple of players to look at but how's everyone getting on? I havent bought anyone. Just been playing with the existing squad. I dont play 4231 so having to retrain Alioski to play as a F9 but his form is poor at the moment. For the way i play i need a striker and CB with more pace. He's by far and away my best player, nobody close. Saiz has had injury problems so he's really carried the attack. Do u play him AMR? AMR or AML, he's equally as good. I've got more goals out of Grot than the big German. I will be cancelling his loan when i start my proper save! A FM18 thread is definitely required to get us underway for this years installment. I've been playing the Beta for the past couple of days and have had some good success with a 4231 formation (Shame the same cant be said for real life at the minute!!). Pretty much all of the front 4 positions have been outstanding, cant fault Alioski / Dallas / Saiz / Lassoga and whilst Lassoga had an injury in the early season Roofe stepped up and scored 10 goals in 7 games. Hes not scored in the 17 that have followed however since he asked for a new contract and got a pay rise. Kun Temenuzkov has had some appearances against the weaker sides in the division and in the cup and seems to be a real prospect, bagging a few goals along the way. 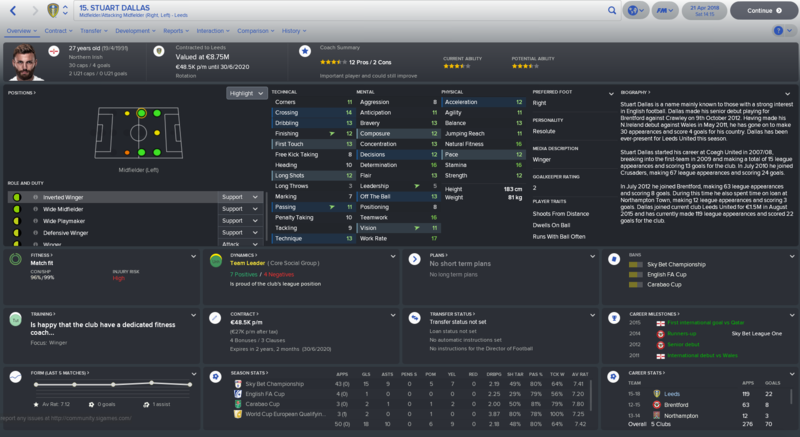 Going to keep a close eye on his progression as I think he could develop into a gem and make some money out of him. 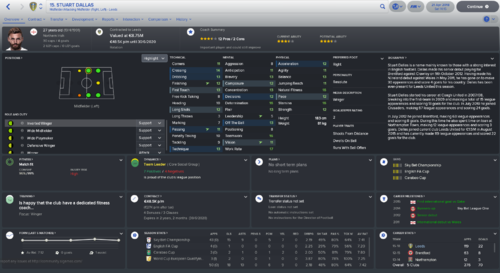 But do have Carlo Holse an interesting looking 18 year old striker prospect joining in January. Signed for 500k but had to offer him 5.75k wages to get him to join. 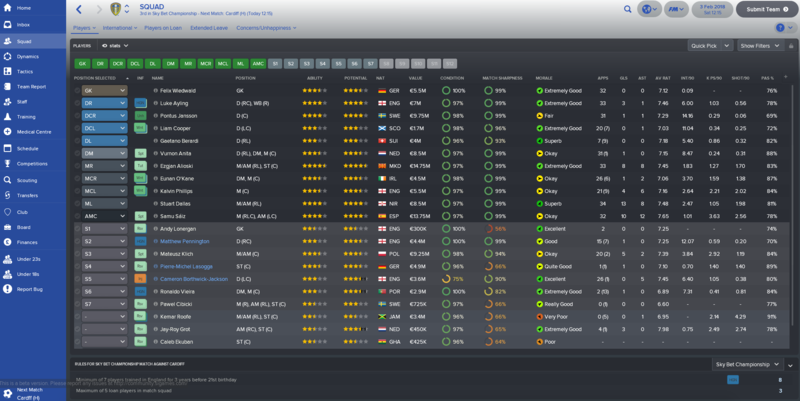 Anyone have any other suggestions on young players to bring in to improve the squad? 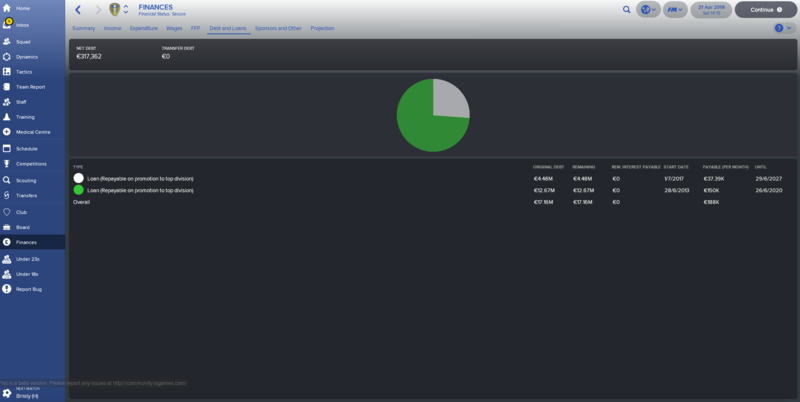 I have the money from the sale of Pablo Hernandez and a the majority of the initial transfer budget to spend. Alex Gersbach - At Rosenborg and a solution to the left back issue - He's only 20 and looks like he could be brilliant. 750k is a bargain for someone with 16 determination. 15 pace and 13 crossing at age 20. 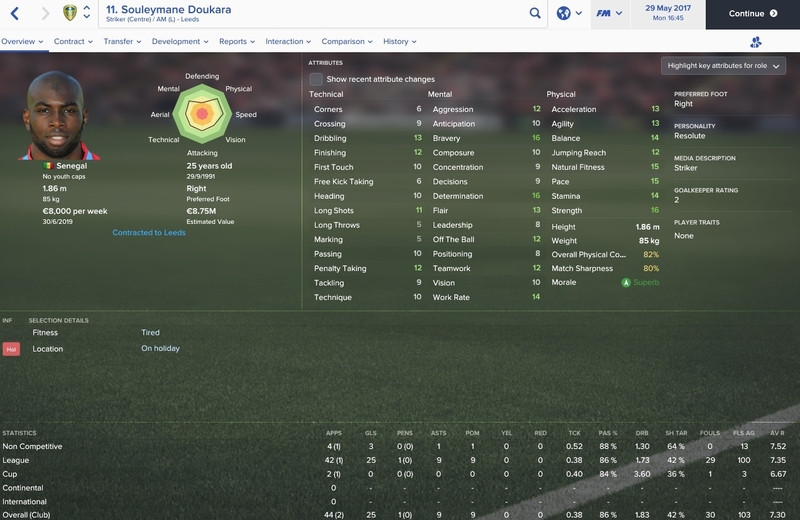 375k and 20% of Profit on Future Sales - Only 20 years old, plays either wing and can cover right back worst case scenario. Worth a punt. Got a Wembley date booked with Southampton which is more than achievable to create a cup upset. @Seb Wassell are the database changes included in 18.03 release or do we have to wait until Friday? Just checking if i can start my proper save yet! For the most up to date 18.1.0 would be the DB for you, although any differences will be very minor. 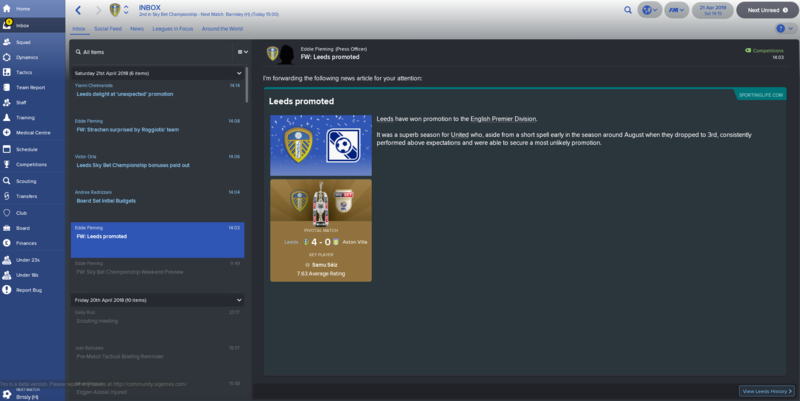 alright JJSaxton, I have been struggling with Leeds, just wondered if there are any Team and Player Instructions you would recommend? Somehow managed to snap up the 18 year old wonder kid Maxi Romero from Velez. Should be an absolute legend in the future. Couldn’t get a work permit so went straight out on loan 100% wages and 170k a week fee! Anyone starting FM 18 thread??? I think the team this year is better than before with good starting budget. I'm looking for suggestion for players to buy in 2018 and I need some suggestions. Depends how you want to play. The squad is loaded with decent players in most positions (left back aside, obviously), with a couple of excellent players in the squad. I enjoyed 3 at the back last year so am going to try again this year, but it presents issues. All down to how you want to shape up. Usually, I prefer 4-2-3-1 Wide and I change instructions based on the players I have.